Love St. Augustine, but like your history sprinkled with a little saltwater? Look no further than the Beachcomber Cottages on Vilano Beach – four buildings located on a quiet street in St. Augustine’s shell-filled Vilano Beach. The Beachcomber Cottages on Vilano consist of two raised cottages and two Caribbean-style homes that are located just steps away from the Atlantic Ocean. Truly one of a kind, these cottages become extra special when combined with the amenities provided by The Bayfront Marin House, an award-winning bed and breakfast located in historic downtown St. Augustine. The four cottages offer seven separate suites—each with their own unique luxuries and first class touches. Rented individually for romantic getaways, or as a group for a special family event, there is nothing else like them on Vilano Beach. 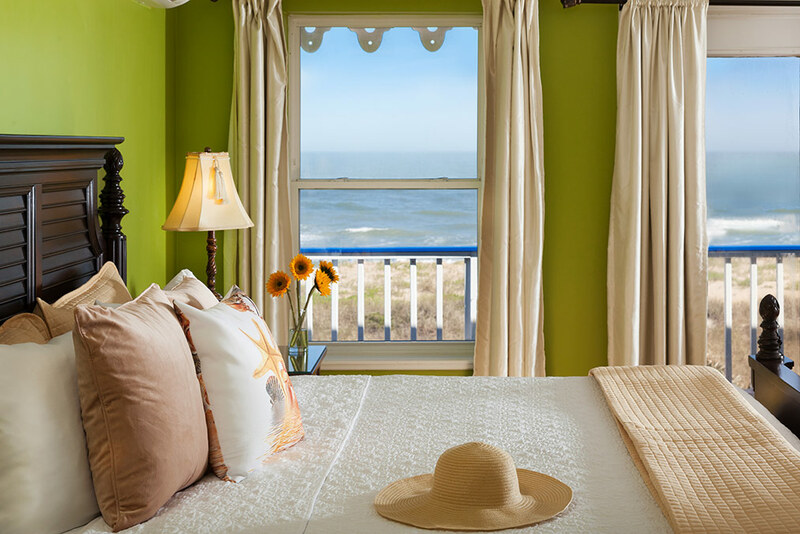 The front cottages—including the Royal Palm, Dunes Suite, and Oceanview Cottage—offer sweeping views of the water, wonderful privacy and a restful retreat from the everyday rush. The third cottage—comprised of the Lagoon Cottage and the Saltwater Suite—offers its own water views, in the form of private pools for each of the two suites in the building, as well as a view of the ocean from the second floor of the Lagoon Cottage suite. The last cottage sits directly on the ocean and houses the Atlantic, Lookout Suites and Sandpiper Suites, all offering great ocean views. All of the locations offer use of the amenity packages from the Bayfront Marin House, including complimentary downtown St. Augustine parking, as well as the opportunity to enjoy breakfast and happy hour at the historic inn, located on the Matanzas bayfront. A stay at the Beachcomber Cottages on Vilano is a way to enjoy the laid-back elegance of the beach, the service found at the Marin, and the history of the nation’s oldest city. It is—literally—the Best of Both Worlds! Book Online today for the perfect romantic getaway or Contact Us for more information about our Beachfront Weddings and Exclusive Event packages. The Beachcomber Cottages on Vilano were recently featured on HGTV's Beachfront Bargain Hunt. Looking for a good Bed & Breakfast?